At some point in your career, you’re likely to consider—if you haven’t done so already—striking out on your own and being your own boss. Ideally it’s a deliberate process. However you go about it, it helps to be informed about the risk, rewards, and details you have to consider when starting a business. Building a company from scratch can test your patience, stretch your skills, and keep you up at night but the benefit is that you are in the driver seat. You have the freedom to set your own goals for professional development and find interesting clients or projects to work on. Get Off the Freelance Roller Coaster! 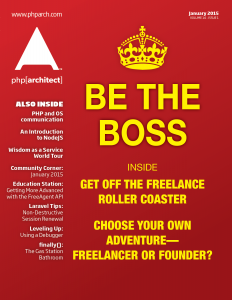 Choose Your Own Adventure—Freelancer or Founder?